Written by: The Geek Girl Project on May 23, 2016. I have always been a geek, and I was lucky enough to grow up in a household that not only let me be a geek, but actively encouraged me. Both my parents were avid readers of both fantasy and science fiction, and books were never forbidden to me. My mother read us The Hobbit as a bedtime story when I was younger, and my father nurtured my love of superheros and magic with comic books and Dungeons & Dragons. Saturday afternoons were Doctor Who (Tom Baker is and will always be MY Doctor), and Sundays were Creature Double-Feature. One of my favorite memories was being Han Solo to my father’s Darth Vader (because my uncle always got to be Luke Skywalker, and I liked Han better anyways) and shooting storm-troopers down my grandmother’s staircase. The best part was that my parents never once told me I couldn’t like these things because I was a girl. I devoured my father’s old Rick Brant books, and then went on to Tom Swift Jr. Dad taught me how to shoot a gun, hunt, fish, and bought me my first comic books (so I’d stop stealing his!). When I announced at age 6 I was going to be a writer, they both said, “Of course you are.” There was never any doubt. My parents introduced me to Anne McCaffrey, Robert Heinlein, and Dorothy Sayers. I learned early on that bookstores and comic shops were portals to magical places, and that’s why the Carter’s Cove novels have, at their heart, a bookstore. When I decided to write an Advent story, it was the perfect setting. There will be, even though this year will be bittersweet. Remember how I said my mom was a big part of molding me as a geek? She loved Carter’s Cove, and unfortunately, she passed away in March of this year, without seeing the first book published. But she got to read all of them up to this year’s, and she made me promise that I would continue writing them. In a way, Carter’s Cove is the world I would have wanted to grow up in and live in, and that’s, to me, the real joy of being a geek. My characters (and yes, they’re mostly female, because I’m a geek girl and I like to write geek girls!) get to do the things that I have always wanted to do, but couldn’t. Not because I was a girl, but because, sadly, the magic of Carter’s Cove doesn’t actually exist in this world. We took this to a whole new level this past year when my mother and I set up an actual Advent Calendar based on the third year’s story for my nieces. It filled two large bags, and came with their own copy of the third story. When I release that one as a book it will have the outline for what we did in the back so that, if folks want, they can do one as well. And it’s a way for me to reconnect with my mom. She loved Christmas, despite (or perhaps because) she was raised Jewish, so she didn’t get to celebrate it until she met my dad. 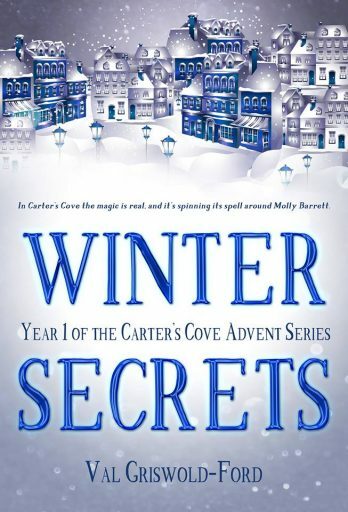 By going back into the world of Carter’s Cove with the bookstore and the teashop and all the things that I put in there for her, I’ll get to spend a bit more time with her, which is the best present of all. Val Griswold-Ford is a writer and life long geek girl. Carter’s Cove #1, Winter’s Secrets, will be available on May 26.